I stumbled upon this hotel through one of the online Hotel booking sites when I was searching for a cheap accommodation in Bangkok. Now, if you're just looking for a cheap place and not too worried about location, this is it. 4 Star hotel, huge rooms and at an affordable price, where else can we get that? Now, here's a tip for you travelers going into a destination where language is pretty much the main barrier, print out the name of the hotel and keep it safe with you. Why? Cause if you plan to take the tuk-tuk or cabs in Bangkok, just show them the address and they'll whisk you there, if you try to verbally say the name, chances are, they get it wrong and take you to some other places. Of course, with UBER, it's easier as most of the cars will be equipped with Waze (see bottom of this post for the waze URL). Check-In process should not take long once you have all the right documents printed (online booking form and passport). Took them about 15minutes to process everything and guide me to my room. Room wish, it's pretty huge, like I mean, I can have a party in here kind of huge and I only paid 1,500 baht per night (flash deals rocks!). Now, the view might not be great cause I was staring at a construction site but heck, the only time I'm at the room is when I return to it to sleep! So no big deal. To some, the place might look slightly old but once you get past that, the place is pretty neat. All the necessary stuff is there, a comfortable bed, an air-cond that pumps out cold air, a CRT TV that works even though every channel is in Thai. And a working toilet! The toilet pretty basic, hot and cold showers are available, a bath tub that can fit a full grown man if I'm sitting up, a functioning throne. Again, everything looks old so you'd just have to bear with it. Now, when I talked to the Manager while waiting for a cab to the heart of the shopping district, she told me that they are in the midst of refurbishing and updating the place. Which is a fantastic thing to hear as the surrounding area is being revitalized. The one issue that I faced with this hotel is, if I were to take the BTS and the MRT to Central Mall or Platinum Mall, I have to get on 3 different lines from the Ramkhamhaeng MRT (it's just across the road from the hotel). Each trip takes about an hour including the walk between stations as the BTS and the MRT lines are not linked directly. Get one of those pre-paid cards and you'll be fine as you just tap as you go rather than lining up for tickets at each station you switched to. Even by cab or UBER, it's a good 30minutes drive provided there's not much traffic and they hop onto the highways. Some cabs tries to take you on a longer route to charge you higher but once you can identify the roads, you can tell them the routes you want them to use instead. So if you've no issues with location of the hotel, this is one of those place I discovered. I've stayed there a few more times since the first discovery but then, I'm lucky that there are friends that would give me a ride back to the hotel after a night of dancing in Bangkok. An interesting restaurant to check out while in Bangkok was this place: Cabbages & Condoms Restaurant. Yup, that’s the name of the restaurant. It’s definitely one of those tourists haunts as that’s where we’d want to go check out when we visits foreign lands. Right? 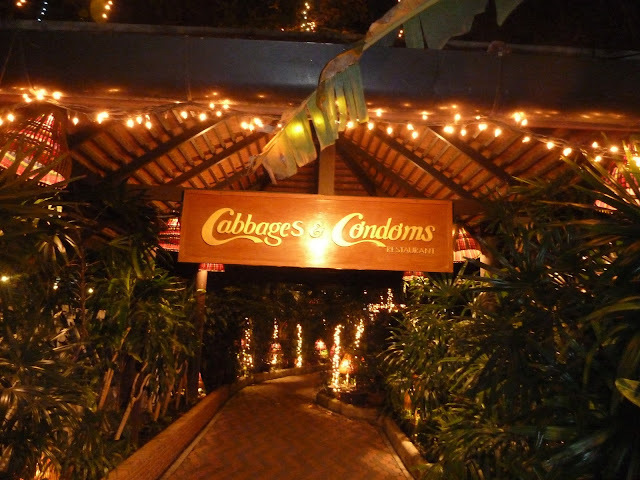 The unique thing about C&C is that The Cabbages & Condoms (C&C) Restaurant is uniquely decorated with condoms from all over the world plus messages and photos that support family planning. Yes, the whole restaurant is littered with condoms! 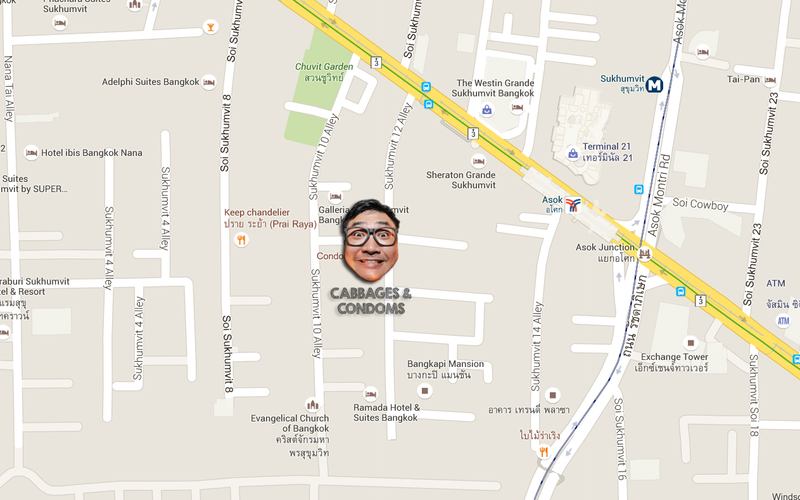 Located at Sukhumvit Soi 12, you won’t be able to spot the venue from the main road but if you are taking a cab, just tell the cab driver to bring you into Sukhumvit Soi 12 and you should be able to spot the signage to the restaurant about 200 meters into the road. After all the oops and the aaahs, my friends and I settled down on a table on the 1st floor overlooking the restaurant below and proceed to place our orders. Before any food was picked, we had our customary coconut to chill the body after spending a day at the pool. Now, a proper meal for me is never complete without a plate of pork! so I ordered the Moo Tod Kra Time Phrik Thai or simply Deep Fried Pork with pepper and garlic. The pork's a tad lean and dry compared to the way I usually like my pork but heck, it's pork. So it's good! The next dish that arrived I think is the Sea Food Kha Ta Ron, which is Stir Fried Seafood with Chilli and herbs served in hot pan. I could be wrong so do correct me if you know the name of this dish. Can't really say much about this as I didn't have any of it. And what Thai dinner if there's no Tom Yam right? We had the Gang Kiew Wan Gung, shrimps in green curry with round eggplants. Surprisingly, none of the Tom Yam I had in Bangkok during my trip was spicy which is fantastic for me! I can't eat spicy food so I had a blast with all the tom yam that was served! And while we chill and chat before heading back to the hotel for our next activity, we had the Som Tum Thai or Thai Spicy papaya salad. To think that it'll just be plain but the way it was prepared is quite interesting. And to compliment all the food, I had the Khao Niao or sticky rice instead of the usual plain rice. I'm not really a rice person, hardly eat much of it as part of my meals but glutinous rice is among those I like and eating it with my hands and dipping them into the sauces and curry is fun in a weird way. It's truly an interesting restaurant to visit, for first time visitors to Bangkok, it's definitely a must-go place to check out if you are thinking of what to eat around the Sukhumvit area. [Posted in 13th November 2013] This is one of those touristy haunt as it's in a nice air-conditioned environment instead the usual road side stalls and open air concept that most of the locals working in the area goes to. It was also close to this dance venue my friend and I was heading to so it was a moment of let's sit back, relax and enjoy a nice meal before we go off to dance. 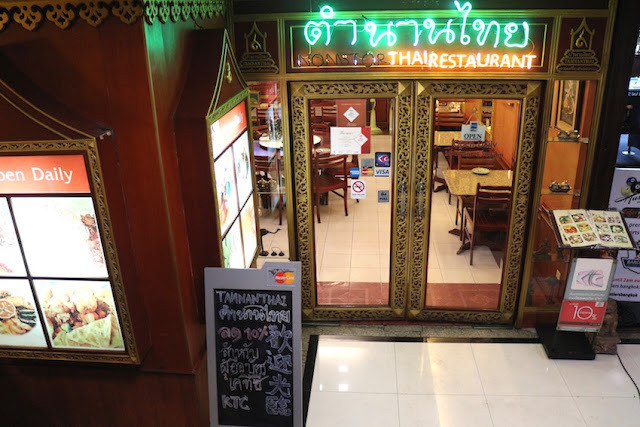 Tamnanthai Restaurant is located at Sukhumvit, just a stone's throw away from Terminal 21 just to give you an idea of the location. The address might say 1st floor but it's located below a flight of stairs as you enter from the front of the building but it's not hard to miss as the branding is pretty big at the front of the entrance. Cozy little restaurant, I must say, and as we reach at 6pm, it wasn't really crowded as most crowd showed up 7pm (but then, 6pm is already 7pm in Malaysia and that's when we usually have our meals!). After ordering our coconut juice, we then proceed to order Spicy and Sour Prawn Soup (Tom Yam!) and as I can't really eat spicy food, I was a bit apprehensive about the soup but it wasn't spicy at all! I then went on to drink quite a few bowls of it in a row! Then it's the Broccoli and Roast Pork next as I just have to have my pork! Crunchy and the Roast Pork was a tad dry but it was all good. Didn't really expect much when I don't see much fats on the pork. And then we ordered the Butter and garlic fish or rather, that's what the waiter told us. The fish is pretty fresh and sweet and even though I seldom eat fish, I ate most of what was brought to us. Sorry for the bad photo as I just snap as I go with my phone's camera. Hard to concentrate on taking photos when we are hungry. Would I recommend the place? Maybe if you have ran out of option on what to eat as a tourist in Bangkok because there's plenty of food out there. Just walk past any stretch of road and highly likely, you'd encounter a food stall. And only when you ran out of places to eat in the area then yes, do check them out, price is quite reasonable but don't expect them to knock your socks off.